I posted a story on Facebook today that had a link to a video of Donald Trump getting called out by a young man for telling a lie in a speech he made. When the young man started to clarify what he was saying, Mr. Trump (in true Trump fashion) cut him off, loudly talked over him, and dismissed his criticism of Trump’s false statement with the wave of his hand and contorted face… Right after he asked the young man if he was from South Korea, and dismissed his answer (“I was born in Texas, and grew up in Colorado”) with a different contorted face that conveyed a deep sense of “Who cares…” You can read the article and watch the short video RIGHT HERE, but I took a screen capture of the “Who cares…” face for you viewing pleasure. It is one of Mr Trump’s go-to expressions, and he employs it every time someone makes any sort of comment that zings him in any way. It’s a face that says, “So what… I’ve got all kinds of money.” I’ll post a big version…. They talk about how they like the way he “tells it like it is.” They admit that he is brash, but try to turn his lack of concern with whom his words are hurting into a some sort of virtue. And they try to do this all in a very “At least he’s telling the truth” sort of way…. But a person can “not beat around the bush” while still saying vile, hateful, and prejudice things. They will say, “At least he’s better than ________.” And the person who finishes that sentence will almost always be a democrat. And I get that… I believe that if we are given the choice between “Not Good” and “Even Worse,” we probably have a responsibility to vote for the lesser of two evils. But there are many choices right now. The choice is not between Trump and Hilary… The choice is between Trump and roughly 16 other republicans. But this one is easy for me to spot, because I’ve got three kids. And when I ask the boy “Why did you go into your mom’s desk and get her Sharpies?” (a serious sin in our household) he will invariably tell me something one of his sisters has done in the past couple days. But that’s not what we were talking about, was it…. And here is why it’s okay for Christians like me to shine a light on the many indefensible things Donald Trump has said and done…. 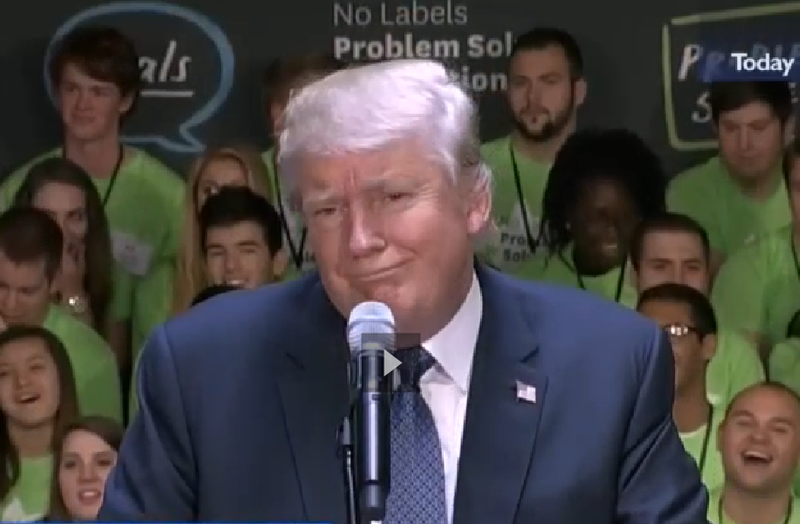 This is the first part of the face that I make when I see Trump talking on the TV. Imagine we’re sitting on a bus. It’s a pretty big bus, and there are all kinds of people on it–young and old, rich and poor, red & yellow, black & white–and we’re getting ready to leave on a long trip. While we’re waiting to leave, in walks the bus driver. Now, not everybody on the bus is paying attention, and not everybody is in a position to see him, but let’s say I notice something peculiar about the bus driver. At first I think to myself, “Wow, those are some really dark sunglasses he’s wearing.” And then I see him folding up something thin and white with a red tip, and I think, “Wait a second… Is that a CANE?!? Is this guy BLIND?? ?” You walk over and wave your hand in front of his face…. Nothing. They made a lovely couple. This is what has been happening with Donald Trump. 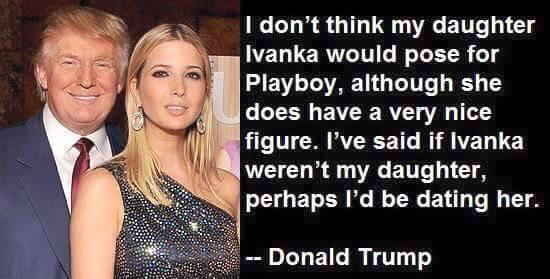 I posted a picture (this one) with a Trump quote about how he thinks that his daughter Ivanka is hot enough for him to date. The right response for people to have when seeing something like this is to say, “This is indefensible.” NOT, “Have YOU ever said the wrong thing or made an inappropriate joke before? ?” And there are pages and pages of things this person has said that are completely indefensible… Things that are not just insensitive or “brash,” but things that are completely CONTRARY to everything Jesus is stands for. Some Christians who can’t deny this (but are so desperate for a republican president) are even looking (in a desperate attempt to win the “Christian vote”) for Bible stories about God using bad kings for good purposes. It’s gross. 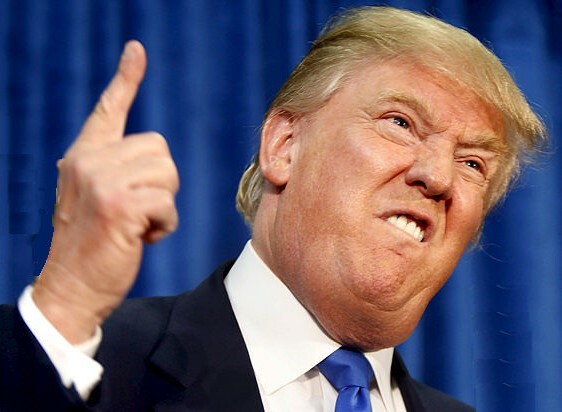 Trump’s xenophobic (and Sodomistic) comments about immigrants, his sexist and demeaning comments about women, his complete lack of knowledge about world foreign policy and world leaders, his propensity toward conspiracy theory, his lack of a basic self-awareness that leaves him unable to even understand his own need for redemption…. The list of things that disqualify him for the office of the Presidency grows every day. I am not “throwing the first stone.” Donald Trump is a man who is worthy of love and compassion…. Just like the rest of us. I believe that God loves him completely. He has his issues, and I have mine. We all need help, and we all have a lot to learn. But calling a person a buffoon who is clearly practicing buffoonery is not being any more judgmental than pointing out that a bowling ball is round. And dense… Especially when that bowling ball is leading the pack of republicans running for President. This person is no more qualified to be President of the United States of America than I am qualified to do open heart surgery. Come to your senses, America. And please, PLEASE, come to your senses, Christians. I’m not saying Donald Trump is not worthy of sitting on the bus… I’m just saying that he is CLEARLY not fit to drive the bus. Thanks again for reading. And thank you especially to the folks who have decided to become patrons of The Boeskool, and who are helping support me. If you’d like, you can check out my Patreon page by CLICKING RIGHT HERE. Twenty two people have become patrons so far, and I’m filled with gratitude. A really cool person named Ania did. She is as kind as she is beautiful… And that is saying a lot. And she is hella talented as well. Check her out. This entry was posted in Uncategorized and tagged Blind man driving the bus, Christians and Trump, Criticizing Trump, Jesus, Trump, Trump and the Evangelical vote, Trumps faith. Bookmark the permalink. WELL DONE! Once again I’m amazed at how much I find myself in agreement with what you write. I say this as an atheist who rarely finds himself sharing opinions with those of faith. My lack of belief comes not from any animosity towards religion, but rather from what I perceive as the total preposterousness of it all. I would appreciate a future article dealing with your understanding of the whole, ” God thing “. How is it this, ” invisibile man in the sky “, effects events on earth? It would appear to me he is responsible for ALL good that occurs, while having NO control over evil. What about life after death? How is it that I’m going to have some sort of consciousness after all the electrical activity of my brain ceases? Should I expect to be reunited with deceased relatives whom I only remember now because their image is imprinted in the circuitry of my brain? In the event my brain fails me before I die, i.e. Alzheimer’s, I will not even recognize those loved ones towards the end of this life. Sorry for getting carried away here, but I truly respect your opinions and would like to hear your views on these topics. There’s a lot here… I’m going to find some time and respond to this. Thanks for the comment, Tom. Thanks for the response. I’ll be looking forward to your views on these issues that have troubled me my entire adult life. As far as the “invisible man in the sky” thing, here is what I have to say about that: We are 99.99% space. Basically, the only thing that keeps one of my hands from gliding through the other one when I clap is magnetic forces. And the matter that makes up our physical bodies was forged in the stars, and then blown throughout the universe in giant explosions. And that matter (mostly space) is drawn together with infinitesimally small vibrations and forces that can’t be explained. And this pile of mostly space/small bits of matter (that are, in actuality, mostly space as well) that is sitting here typing this reply to you…. This pile called ME somehow has consciousness. And it has the ability to ask big questions about life after death and the problem of evil. I don’t understand it all, but I can tell you this much: There is magic everywhere. There is goodness and evil just as certainly as there is light and dark. And I am drawn to the light. I am drawn to the goodness, like one atom is drawn to another. And it fills me with a sense of reverence. There is something bigger than us in the universe. There is something that fills us with a common sense of Quality. And Beauty. And Truth. And whether that Bigger Thing–that “God”–has a white beard or not is completely immaterial. We don’t comprehend the divine–We take steps toward it. And the closer we get, the more infinite the journey seems…. But the destination is love. Or whatever word we can come up with to describe it. Chris Boeskool: [Insert liberal tripe here.] Chris, I have yet to read anything that isn’t straight out of the Democrat/uber-liberal playbook. It’s why you non/un-friended me on FB. You spew. You do not enlighten. I have nonchalantly followed your blog. Blather on, sir. So, Chris, what do you think about Ms. Clinton? Her actions are being investigated by the FBI. She has potentially committed treason. I have yet to see any of your blog posts even suggesting the possibility of that. I suppose God loves a traitor, too. @Greg, Chris has more truth and reality in every sentence he writes than you do in your entire Facebook feed. Go on with you and find some right wing nut job to comment on. Is Trump a Christian? What was that thing Jesus said about the camel and the eye of the needle? The Christians supporting Trump are suffering some severe cognitive dissonance. The resulting effort to find any consistency between Donald Trump and Christianity is so bizarre they look ridiculous. They would feel better and look more truthful if they chose one or the other. Love the bus metaphor. It’s dead on. People have taken “judge not” and extended it far beyond its actual meaning. Even though we’re not to judge Mr. Trump’s fitness for eternal life, as you clearly pointed out, we have a responsibility as citizens to judge his fitness for the presidency. And in that he comes up way, way, way short.